One of the issues I have with modern thermometers is that they aren’t made with children or infants in mind. Sure, you can buy “infant-friendly” thermometers at your nearest department store. But anyone that’s ever used one knows the struggle that goes along with it. You find yourself cradling your child in your arms, who is writhing and slithering, while you try your damndest to hold the thermometer in place; your ears bleeding from the blood curdling screams and cries. Some store-bought thermometers measure temperature via the ear, others via the mouth, forehead, and yes… that place where the sun doesn’t shine. But many of these devices—or their creators—forget to factor in what it’s like dealing with a sick child when you need a temperature reading most. Let’s be honest, even when your child is perfectly healthy it can be a real hassle getting an accurate reading. Queue the MyKi Care smart thermometer. Right off the bat, it’s much easier to use because it acts more like a wearable. More importantly, it will provide real-time and up-to-date readings anytime you’re ready or need them. Real-time, as I’m sure you’re aware, means you can get them anytime, anywhere at a moment’s notice, and it’s incredibly convenient. Of course, the most relevant question is whether or not the MyKi Care is accurate and works as advertised. That’s what we’re going to explore in this review. Keep in mind, like our previous MiniFinder Pico GPS review, I’m going to structure this one a bit differently. 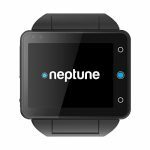 That’s because the MyKi Care is not a conventional wearable like a smartwatch or fitness band. The smart devices of today—MyKi’s Care included—generally come with a ton of bells and whistles that you don’t exactly need, especially if you were to compare an upgraded device to that of its more conventional counterpart. A thermometer, for example, must be able to provide accurate readings of your body temperature, or your child’s. That’s it. Everything else is excess, yet certainly convenient. As thermometers have evolved, more features have been introduced like faster reading times, better and more robust reading support via different body areas, and similar updates. The MyKi Care kicks it up a notch by adding a “smart” factor, which means tapping into your mobile device or smartphone and syncing the two platforms. 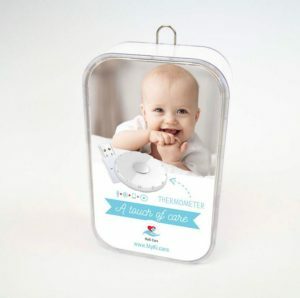 This allows you to say, check on your baby’s temperature while they remain nestled away in a crib in their nursery, and you are in your own bedroom or another room of the house. 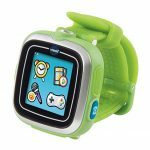 The always-on and real-time functionality means that the thermometer portion of the setup is monitoring your child “24 hours a day” and you can check-in anytime, from anywhere. This information can also be shared with authorized parties, such as a pediatrician. 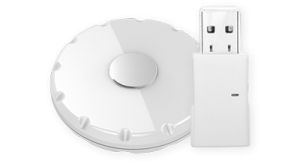 The data stream can either be transmitted directly to your phone via Bluetooth 4.0 LE, or you can use the included Care BT device which syncs up the data stream via your home WiFi network. 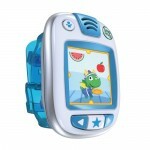 That is what allows you to essentially check on your child from anywhere, even outside your home. And it works fantastic, with little to no signal or monitoring issues. The thermometer resembles a medical sensor or node and is placed under the armpit. 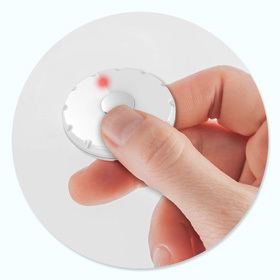 There are hypoallergenic stickers included, as well, that adhere the sensor to the body. If your child has sensitive skin—as mine does—you’ll be happy to know it doesn’t cause irritation. Also, after placing the sensor against the body it looks pretty thick, which seems as if it will be uncomfortable for your child. My child never seemed to notice, and she’s almost two, so if it does cause discomfort, it’s not much. I did give it a try on my own body just to test it out, and after a few minutes, it felt like it wasn’t even there. MyKi says the thermometer can be used on children from age infant up until 13 or so. While that’s likely true, and I don’t see any reason why it wouldn’t be, you might find it tough keeping older children from removing the sensor. Just something to keep in mind. Once you sync up the sensor with the MyKi Care BT unit and the mobile app—covered in more detail later in the review—you’re good to go. Overall, it’s incredibly easy to setup, and just as easy to grab a reading. Readings are handled and reported automatically by the entire system, transmitted to your mobile device via the app constantly. If you want to grab a custom reading at any time that option is there too and works great. Overall – 4.5/5: The MyKi Care smart thermometer allows you to get easy and accurate temperature readings from your child, at any age. Now, to the most important question of the review: Does it work and are the readings accurate? Yes, I believe it is accurate. I say “believe” because this is a tough detail to whittle down. There isn’t really anything to compare it to in regards to accuracy, reading area, and continuous updates. In my own testing, I used several thermometers, all of the varying types. 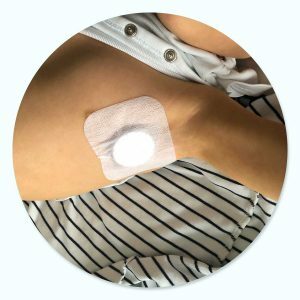 What makes it particularly difficult is that MyKi’s thermometer remains attached to the skin and body at all times, so it is essentially primed at all times. As you know with conventional thermometers, when you take a reading it takes a few moments before the device is ready to return some numbers. The cool measuring portion of a thermometer often has to warm up first. This can lead to many inaccuracies, which are exacerbated even more if your child struggles or moves. All in all, I found that yes, the MyKi Care seems incredibly accurate and did a much better job providing temperature readings than any of the other devices I tested alongside it. When I did feel like the other thermometers were providing an accurate reading, as well, everything matched up. One of the best features is that, because the sensor remains on their body all day and night, you can see 24-hour readings delivered through a unique pattern interface. You can, for example, see when their temperature started dropping or rising. The information is presented with incredible precision, up to 0.01 degrees, allowing for unprecedented readings, at least compared to anything I’ve ever seen or experienced. Similar to being able to hear their heartbeat, there’s something incredibly soothing about watching and or being able to see your child’s warm body temperature. Readings – 5/5: The readings are definitely accurate and detailed; up to 0.01 degrees in precision. The MyKi Care mobile app is available for Android via Google Play, and iOS via the App Store. Even though it’s early days for the platform, it receives regular updates and I encountered very few bugs or experience concerns. The UI isn’t gorgeous but it isn’t hideous either, and it works great. It’s responsive, easy to read, and even easier to navigate through the various options. Right up front, you will see real-time measurements provided you have a synced thermometer, with the newest reading presented front and center. You can also tap the readings page to see measurement history, and there is a remote monitoring section, as well. During setup, you fine-tune the details related to your children such as name, age, height, and weight. You can also set high or low-temperature alerts, which let you know as soon as your child’s body temperature passes a certain threshold. I have to say it’s simple, but the features are plenty. Furthermore, the information you’re most interested in—your child’s temperature—takes precedence and to me, that’s the most important element of the app. Mobile App – 4/5: The mobile app could do with a prettier skin, but that’s a small gripe considering it works great and is user-friendly. 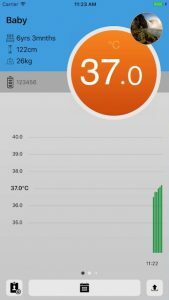 Should I Buy the MyKi Care Smart Thermometer? Look, not every parent is going to want real-time readings of their child’s body temperature. It’s a bit much if you check your child every minute for the full 24-hour schedule. But the option to check when you have time via your smartphone is great. And, the neatly detailed trends are interesting to look at. That said, the reality is, I could just walk over to my daughter and put my hand on her forehead. Is she warmer than usual? No, okay we’re good. So the real-time stuff is just an additional feature as far as I’m concerned, super convenient or not. The real lure is the accuracy and ease-of-use the thermometer provides. I have yet to encounter another thermometer that is as accurate, and as easy to use as this one. Seriously, it’s a pain getting conventional thermometers ready to take a reading and that’s true of all types. Even the forehead-based thermometers are a pain, unless your child is fast asleep, which can be few and far between. If you want an accurate and easy-to-use thermometer, then yes, I say spring for the MyKi Care. 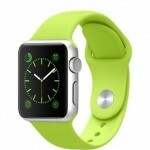 The fact that it can be worn 24/7 and offers real-time monitoring is just icing on the cake. Where Can I Get the MyKi Care? You can order the MyKi Care smart thermometer via the company’s official site here, or via Amazon, if you prefer a more familiar storefront. Disclaimer: Allterco JSCo. 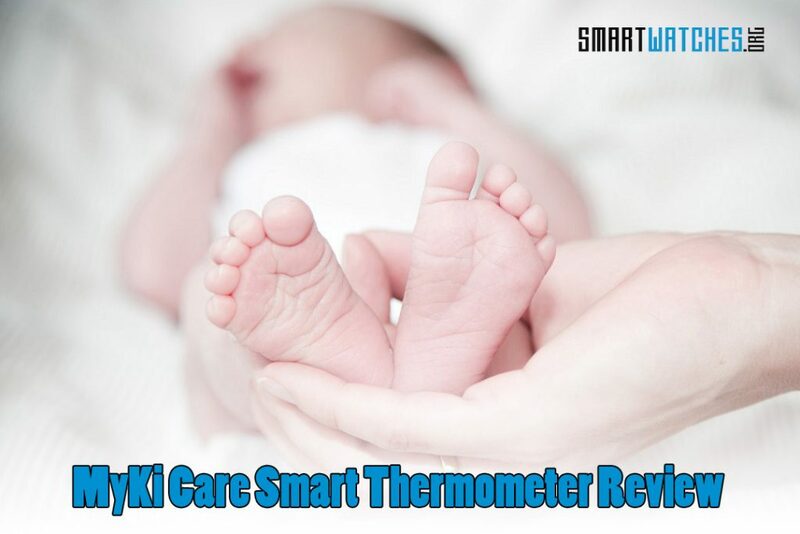 and Allterco Robotics graciously provided the MyKi Care smart thermometer for this review.